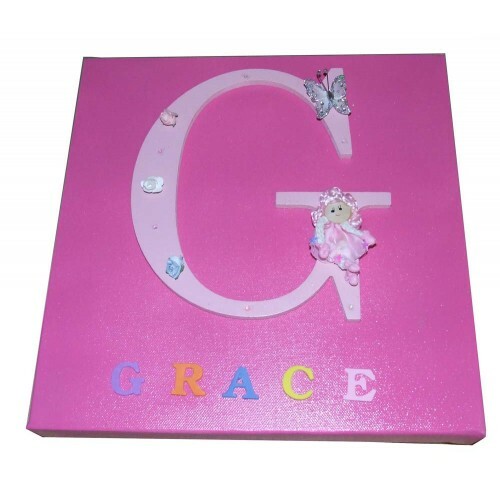 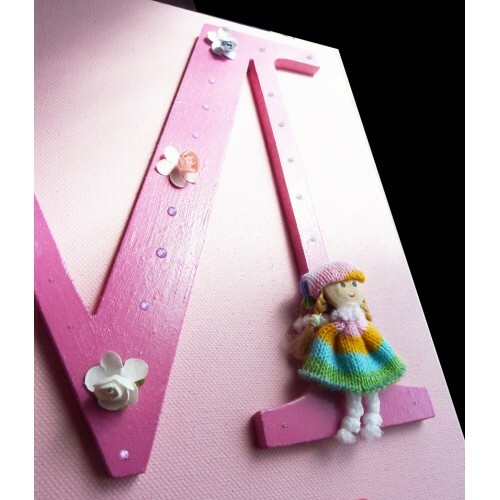 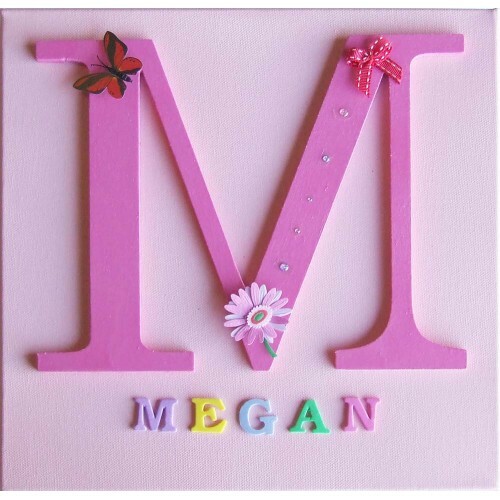 A Luxury, chunky 12"x12" (305mm x 305mm) deep box canvas, available in light or dark pink or blue, with a painted wooden letter attached, with lots of lovely embellishments to make it look fabulous and as each one is made by hand, each one is unique and slightly different. 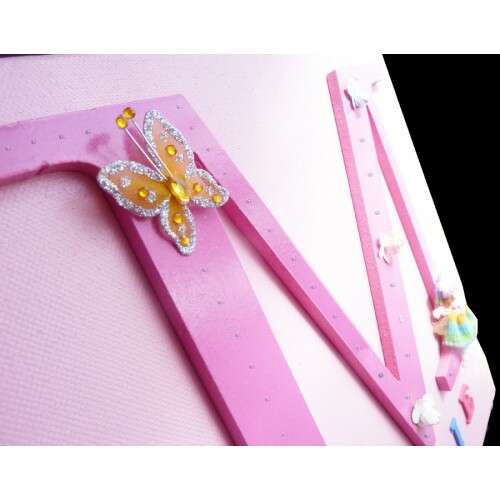 We use a variety of different embellishments, dependant on whether it is for a boy or a girl; for girls we use Butterflies, fairies and princesses, along with sparkly things, hearts and pretty flowers and for boys we use a variety of brightly coloured pom-poms, cars, ladybirds, wooden and clay embellishments alongside stars and buttons, each piece will be made up by hand and so these keepsakes will be unique every time, the photos are just a guide to what your finished piece may look like, a really lovely personalised baby gift to brighten any room. 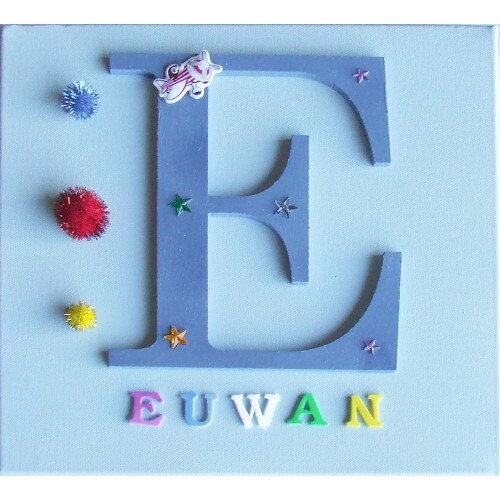 These pieces are a luxury baby or child keepsake with many bright and interesting attachments, making each one a unique keepsake and creating an original and unusual gift that will make yours stand out from the crowd. 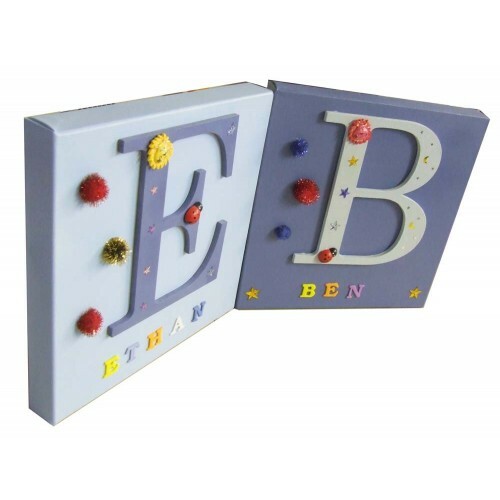 We specialise in luxury baby keepsakes and each piece is created by hand and so each will be given a really personal touch to give you the best possible finished keepsake and something you will be proud to display and enjoy. 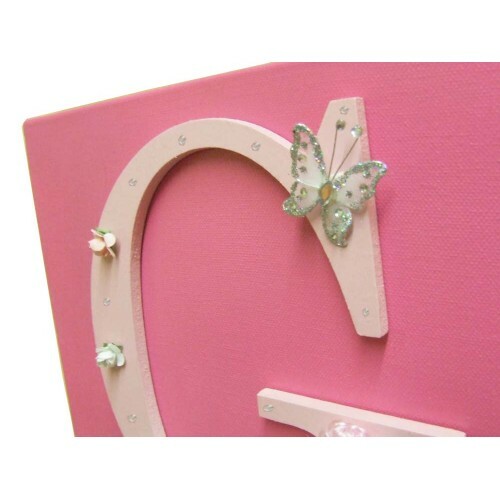 These quality 2" (50mm) deep, chunky canvases are of a great quality and will look fabulous as an original piece of artwork on any child's wall, they are available in Blue or Pink and also available in light and dark shades, so perfect to compliment most colour schemes and brighten any nursery wall, the colours will compliment each other as the paler canvas will be paired with the brighter letter and the brighter canvas colour will be paired with the paler coloured letter, ensuring it really stands out. 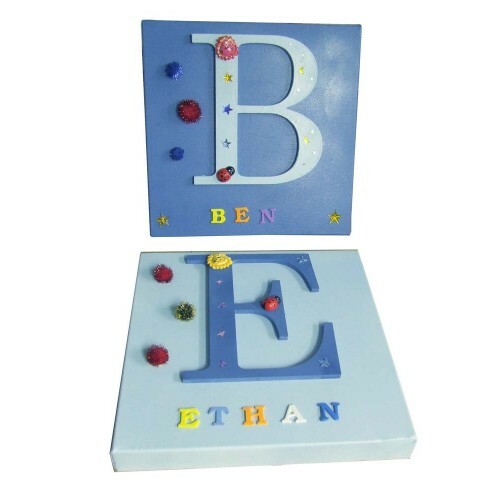 Great as a personalised gift for any child, as the bright colours and interesting embellishments will draw the eye and capture young imaginations, a perfect way to liven up a child's nursery or bedroom.